When Venus Demarco was diagnosed with breast cancer, she did what anyone would do. She saw specialists, got second opinions and began weighing her options for a path to recovery. Unlike most individuals, though, her decision did not include cutting, burning or poisoning herself (surgery, radiation or chemo). Instead, she went on an international journey of self-discovery where she learned to heal not only her body, but also her mind and spirit. 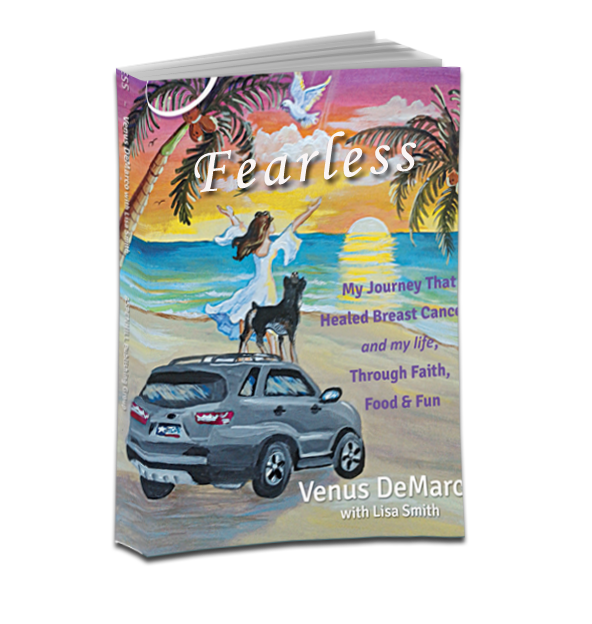 FEARLESS: My JOURNEY THAT HEALED BREAST CANCER – And My Life, THROUGH FAITH, FOOD, & FUN is Venus’ story of natural salvation from one of today’s most diagnosed diseases. This memoir will take you along on Venus’ life-changing (and at time humorous) adventure as she looks cancer in the face and, with God’s help, defeats it. This story will educate and inspire you to live a fuller and healthier life and to see the possibilities found on the road less traveled. Let’s prevent breast cancer and not wait around for a cure!